On Square Solitaire, your idea is to create 5 x 5 square out of cards that comes out of deck in random order. 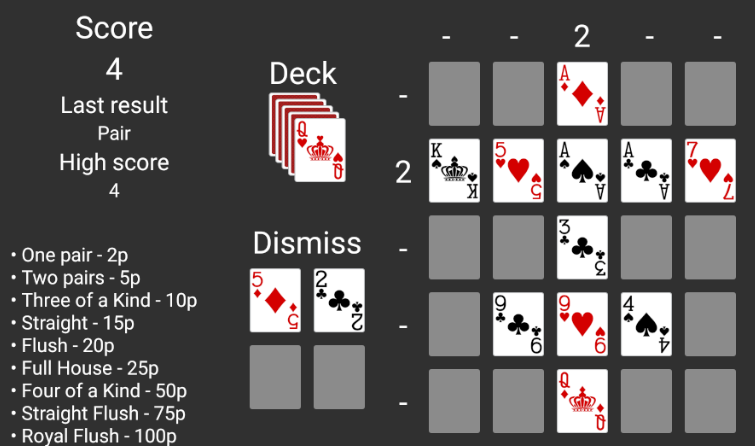 You can dismiss four cards and you can place up to 25 cards on square in following rules, which are visible on the UI (scoring). This is more like "brain" game, because you need to dismiss cards wisely and try to use all horizontal and vertical line card spaces to get combination of as high score as possible.